A new, stunning 27 inch 2K QHD monitor with USB Type-C™ connectivity, BenQ's first of its kind. Place your notebook underneath the display with its built-in USB-C™ Docking Station and get a range of connectivity options without the messy cables or a separate docking area. Get rid of all the cables with the USB-C™ equipped BenQ PD2710QC design monitor that sports a minimal bezel design and space gray metal finishing that complements any working space. 1440p QHD resolution and 100% sRGB color space coverage plus an extensive range of display modes await you to work in sharp, fine detail. ✔ USB Power Delivery - Power and charge your laptop, tablet or mobile phone through the USB-C cable and connector (up to 61 W). ✔ Fast USB - Enjoy fast data transfer rates up to 5 Gbps. ✔ 2K QHD Video Display - Display 2K QHD video from your notebook over a single USB-C connector and cable. Enjoy greater image detail (109 PPI) and crystal clear pictures with 2K QHD (2560x1440) resolution that provides 77% more working space than a full HD display. Work confidently in sRGB or Rec.709 color space from a wide viewing angle. All BenQ Designer Monitors in the PD series are Technicolor Color Certified, ensuring consistent and accurate colors for impressive color performance. For those who strive for a clutter-free space, the slim and reversible USB-C cable and connector allows your notebook to tap into the dock’s wide range of connectivity options. Charge your device, transfer data, transmit audio and video, and connect to the Internet, all through the convenience of one cable. No more obstructing views! With your notebook wide open and connected to the docking station, let your design inspiration flow as your notebook’s contents seamlessly integrate with the elevated* display above. Enjoy greater productivity and an expanded screen space without having the need to move your head side to side between screens. Height adjustment up to 18 cm. Suitable for a 15 inch wide notebook. Ergonomic design supports a range of height, tilt, and pivot adjustments. The USB-C&trade dock™ is only the start. The BenQ PD2710QC is a daisy-chaining* enabled display equipped with multi-stream transport technology (MST) allowing you to extend your notebook’s screen across several displays using DisplayPort output for a multiple monitor setup. Appreciate the boundless views from PD2710QC’s edge to edge design with minimal bezels on all four sides. *The maximum number of displays for daisy-chaining is 4. Multitasking is made easy with desktop partition. Split your screen into multiple windows with BenQ’s proprietary Display Pilot Software. CAD/CAM mode - Offers superior contrast on lines and shapes of technical illustrations, bringing out the smallest details to view. 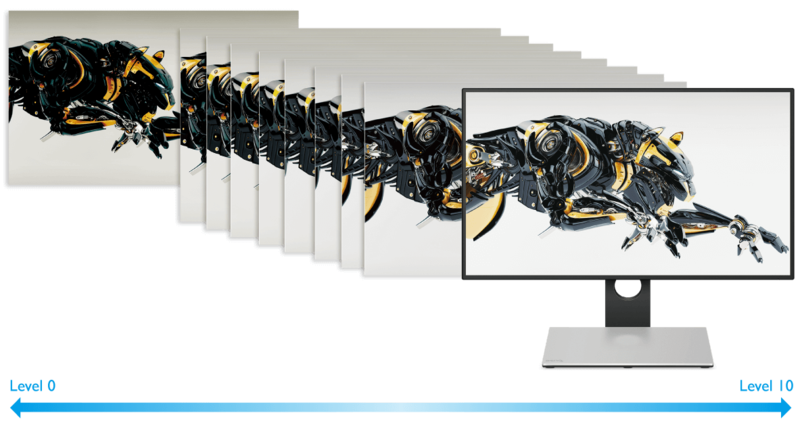 For an incredible display performance, pair CAD/CAM mode with Pro/E, SOLIDWORKS, AutoCAD, CATIA or other CAD/CAM software. Darkroom mode - Adjusts the brightness and contrast of images giving clarity and sharpness to details, creating the optimal setting for work in darker post-processing environments. Animation mode offers 10 levels of display brightness so you can see every detail clearly in any ambient lighting. Animation mode - Dark areas of images often become a problem for designers working with intricate designs. Animation mode enhances the brightness of dark areas without over-exposing bright image areas.